DOG WALKS...PET DAYCARE...PET BOARDING...IN HOME VISITS. 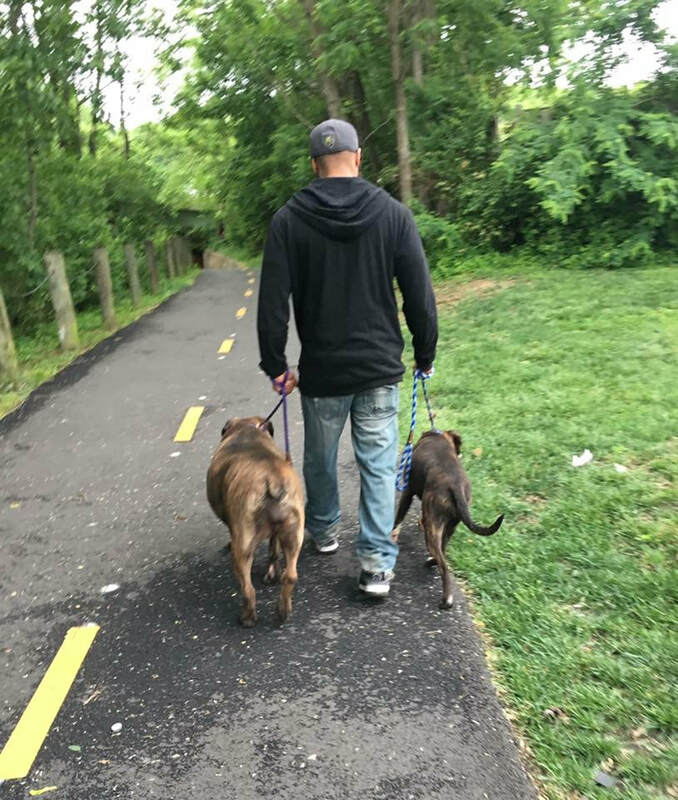 JUNE 2018 WE STARTED PROVIDING THE FOLLOWING SERVICES: DOG WALKS, IN HOME VISITS, PET SITTING AND BOARDING. TO DATE WE HAVE HAD 259 DOGS AND CATS COME THROUGH OUR PROGRAM WITH FIVE STAR RATINGS. HALF OF THE 259 OR STEADY REPEAT CLIENTS WHILE THE OTHER HALF ARE FIRST TIME VACATIONERS. DOG WALKS INCLUDE THE FOLLOWING: WE WALK YOUR DOG WITHIN YOUR COMMUNITY AND/OR DESIGNATED AREAS THAT ARE SAFE AND SECURE. WE ARE TRAINED TO PROPERLY KEEP YOUR DOG AWAY FROM OTHER DOGS DURING WALKS TO AVOID STRESSFUL UNPLEASANT MEETINGS. WE DO NOT TAKE DOGS TO DOG PARKS. WE CLEAN UP AFTER YOUR PET, WE PROVIDE DOGGY WASTE BAGS AND WIPES. RAIN OR SHINE WE WALK YOUR PET! NEW CLIENTS RECEIVE A GOODY BAG! PLEASE EMAIL US WITH QUESTIONS OR TO BOOK A MEET AND GREET TO PROCEED WITH DOG WALKS. PET DAYCARE INCLUDES THE FOLLOWING: YOU CAN DROP OFF YOUR PET AND PICK UP OR WE CAN ARRANGE FOR US TO PICK UP AND DROP OFF YOUR PET. YOUR PET WILL SPEND THE DAY AT OUR HOME WITH OTHER PETS SUCH AS DOGS AND CATS RANGING FROM PUPPIES TO SENIORS. YOUR PET WILL BE PROVIDED WITH A SAFE AND CLEAN HOME WITH LOTS OF DOG BEDS, BLANKETS, TOYS, A FENCED IN YARD AND MEALS. 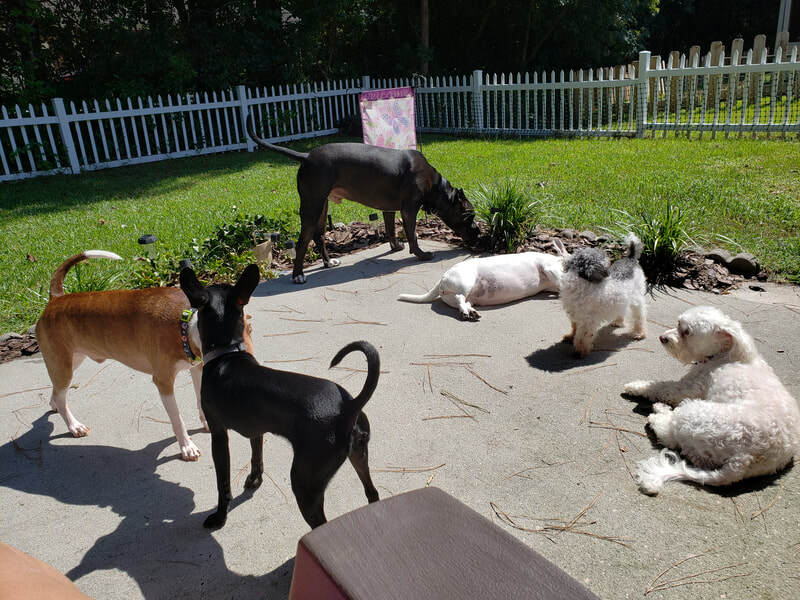 IF YOUR PET IS NOT SOCIALIZED AND PREFERS TO BE BY ITSELF WE DO HAVE FENCED IN SECTIONALS WITHIN THE YARD AS WELL AS FULLY FURNISHED DOGGY/PET ROOMS FOR YOUR PET TO REMAIN STRESS FREE AND AWAY FROM OTHER PETS. ALL PETS MUST BE FULLY VACCINATED AND FREE OF FLEAS AND OTHER TRANSMITTAL DISEASES. 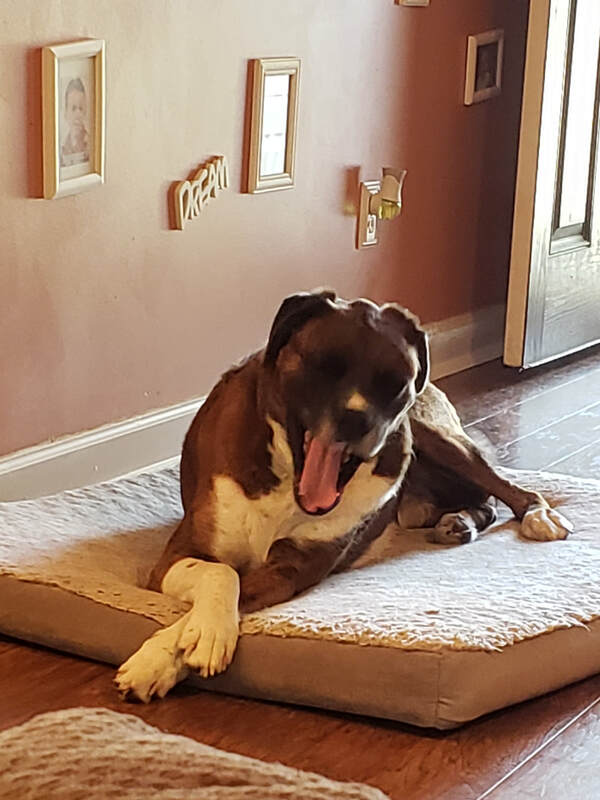 OWNER MUST PROVIDE PROOF OF VETTING PRIOR TO DAYCARE. OWNER IS RESPONSIBLE FOR PROVIDING FOOD, MEDICATIONS AND ANYTHING ELSE THE PET NEEDS WITHIN THE DAY. WE WILL PROVIDE CLEAN WATER AND FOOD BOWLS AND CLEAN CONDOS (CRATES) AS NEEDED. EACH NEW CLIENT GETS A GOODY BAG! PLEASE EMAIL US WITH QUESTIONS OR TO SCHEDULE A MEET AND GREET TO PROCEED WITH PET DAYCARE! PET BOARDING INCLUDES THE FOLLOWING: YOU CAN DROP OFF AND PICK UP YOUR PET OR WE CAN ARRANGE FOR US TO PICK UP AND DROP OFF YOUR PET. PET BOARDING FOLLOWS THE PET DAYCARE ROUTINE BUT WITH OVERNIGHT STAYS. ALL DOGS WILL GO OUTSIDE FOR POTTY EVERY 2 HOURS OR SOONER AS NEEDED BASED ON THE DOGS ROUTINE. OUR GOAL IS TO KEEP YOUR PET STRESS FREE AND CONSISTENT WITH IT'S DAILY ROUTINE AT HOME. WE ARE EXPERIENCED WITH ALL AGES AND BREEDS OF DOGS AS WELL AS CATS. WE ARE TRAINED AND EXPERIENCED WITH ADMINISTERING MEDICATIONS (ORAL, TOPICAL, INJECTIONS, EYE MEDICATION AND MORE). WE ALSO OFFER BATHS, EAR CLEANING AND NAIL TRIMMING. WE ARE FIRST AIDE TRAINED WITH DOG CPR. PLEASE EMAIL US FOR MORE INFORMATION OR QUESTIONS AND TO SCHEDULE YOUR MEET AND GREET FOR PET BOARDING. ALL NEW CLIENTS GET A GOODY BAG! IN HOME PET VISITS INCLUDE THE FOLLOWING: WE WILL COME TO YOUR HOME DURING REQUESTED TIMES TO FEED YOUR PET(S), FRESH WATER, WALKS AND OTHER ROUTINE ITEMS AS SCHEDULED SUCH AS LITTER BOX CLEANING, ADMINISTER MEDICATIONS, PLAY/SOCIAL TIME, CHANGE PEE PADS, CLEAN CRATE ETC. EACH VISIT WILL BE A MINIMUM OF 30 MINUTES. WE WILL SECURE THE PROPERTY UPON DEPARTURE. EMAIL US TODAY WITH QUESTIONS OR TO SCHEDULE A MEET AND GREET FOR IN HOME PET VISITS! EACH NEW CLIENT RECEIVES A GOODY BAG! OWNER WILL RECEIVE PICTURES AND UPDATES DURING EACH SERVICE EITHER BY TEXT OR EMAIL.